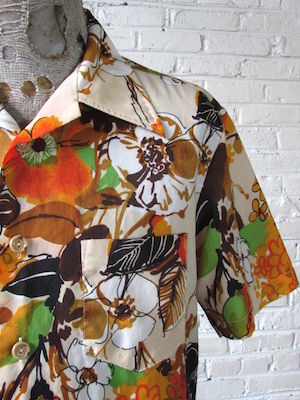 Home > 1970s Disco Clothing > All Disco Clothes > (M) Vintage Mens 70s Disco Shirt! Vibrant Flowers in Orange, Green, Ochre on Cream! Mens vintage 1970s short sleeved disco shirt. This wild disco shirt has a cream base bursting with flowers in vibrant shades of orange, green, ochre, dark brown and tan! Has a super wide & pointy disco era collar. Closes in the front with marbled tan buttons. One pocket on the chest. Shirt has a tapered hem. Tagged by JcPenny Towncraft. 100% Polyester. Chest: 40" MEDIUM. No Stretch.